You organize your closet to find the best outfits, you organize your finances not to overspend, you plan your exercise routine, and you even orchestrate the details of your vacation. 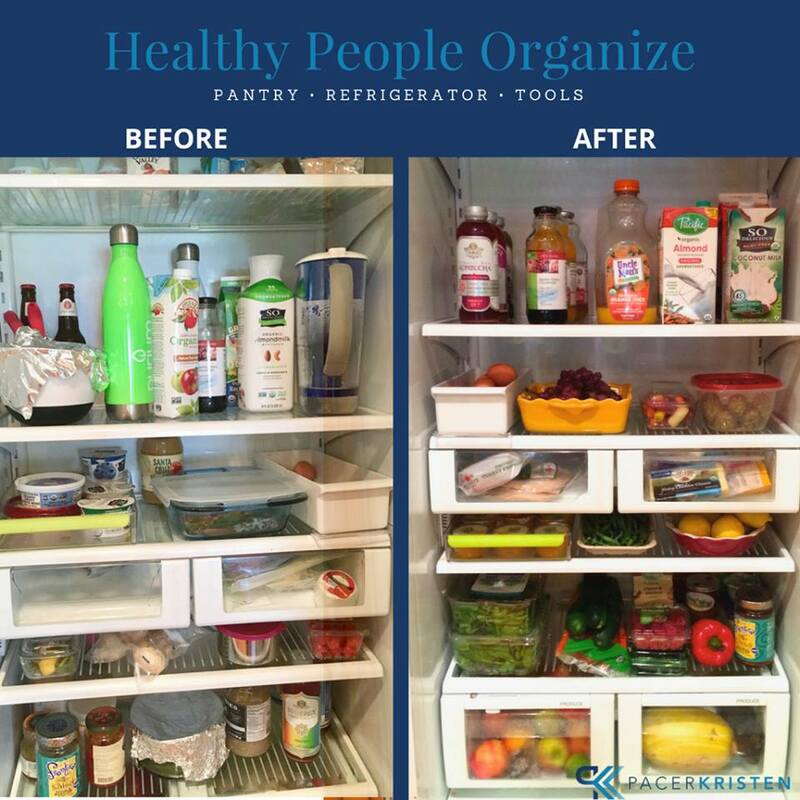 When did you last ORGANIZE your kitchen for NUTRITIONAL SUCCESS? Imagine trying to get dressed when you cannot find anything! It’s depressing, frustrating, and totally uninspiring! If your fridge and pantry are in a state of disarray, your diet inevitably follows that path too! Instead, cleaning out the kitchen is a weekly habit that healthy individuals use to stay on track! It’s a smart action you can take routinely, and if you’re not already doing this, spring is the ideal time to start! Unload the entire fridge. Wipe down & sterilize. Clean, cut, and place fruits & veggies on a visible shelf. Snack foods such as carrots, grapes, and energy bites can be placed into snack sized containers for fast lunch-making. Place similar items together (beverages, snacks, animal protein, greens) on the same shelf. Throw out and do not restock sauces and dressings that are full of hidden sugars, high sodium and chemicals (soy lecithin, high fructose corn syrup, etc..). Refrigerators get cluttered with these bottles…and so does your health! Instead, use oils, flavored vinegars, lemon juice, spices, and fresh herbs. Package nuts (walnuts, pistachios, pecan, almond), and seeds (hemp, flax, and chia), in the freezer to keep from going rancid and to provide a crunchy snack on salads, soups, or wraps. Consider adding fermented foods including kombucha, kefir, coconut yogurt, kimchi, sauerkraut and natural pickles to improve your gut health. If including animal protein, stock your fridge with organic, nonGMO products that are pasture-raised to limit your exposure to antibiotics, pesticides, and toxins. Pull out each item, read the label looking for whole food ingredients (items you can pronounce and recognize), and toss what shouldn’t be there. Reorganize according to categories: soups, beans, grains, sauces, oils, etc. PASTA: toss white pasta and restock with whole grain, vegetable, or bean/lentil based pastas. Tall and short glass containers keep pasta fresh, visible, and ready to grab for fast dinners. BREADS: toss white bread in favor of sprouted grain breads such as Dave’s Killer Bread or Ezekial, whole wheat tortillas and pitas. 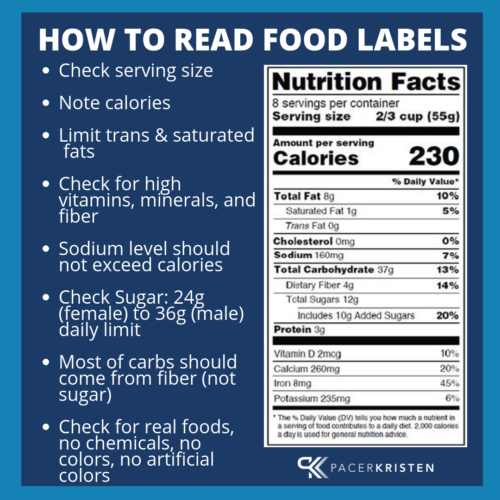 Read your labels to maintain low sugars, real ingredients, and high fiber from real sources. WHOLE GRAINS: Replace “white” grains such as white rice with nutrient dense whole grains including brown rice, brown basmati rice, wild rice, bulgur wheat, barley, farro, oatmeal, quinoa and buckwheat (these two are actually seeds, not grains). BEANS: Look for BPA free cans and stock up on White Northern, Garbanzo, Red Kidney, Black, and Refried (vegetarian/low sodium) beans with low or no sodium or added ingredients. Amy’s, Eden Organics, and Westbrae are my favorite brands. Beans are super to have on hand for easy dinners. SPICES: Aromatics and spices can boost your flavor with great health benefits (many are great sources of antioxidants) with no guilt or downside of calories as is the case with sauces, but they DO have expiration dates! Read dates, smell each one, and if no fragrance, it needs tossed! CEREAL: Use the 5 to 1 Rule for Fiber (ratio of total carbs divided by fiber should not exceed 5, otherwise most of the carbohydrates are simple sugars. For example 35 grams total carbs divided by 5 grams fiber = 7. It exceeds 5, so this packaged food does not belong in your pantry. Look for organic, nonGMO cereals. OILS: With their healthy fats, oil can go rancid, so toss old ones and find a cool pantry space to line your shelf with avocado and coconut oil for higher temperature cooking)as well as olive oil for lower temperature sautes and salad dressings. Grape, walnut, and sesame are also great to have on hand and can sustain higher temperatures too. COOKIES, CHIPS, CRACKERS: most are made with unhealthy fats, processed grains and sugars, with high sodium. If you are opting to keep these on hand (I get it…I’m raising three children), use organic, nonGMO cookies, chips, or crackers made from real ingredients. My favorites include Mary’s Crackers, Late July Chips, and homemade or Annie’s cookie mixes. SOUPS AND SAUCES: Having pasta sauce on hand as well as organic broth-based soups are great for quick meals. Check for low sugar and sodium without preservatives. NUTRITIONAL PRODUCTS/SUPPLEMENTS: Toss supplements with ingredients that include names ending in -ate, -ite, or starting with the prefix “dl.” Also the vitamins themselves cannot be the ingredient if being sources from a real food. Avoid products with phrases such as “Vitamin C as Ascorbic Acid.” Those are tip offs for synthetic/chemically produced vitamins. Opt for real food sourced supplements. Check out my favorite, organic, nonGMO, whole food sourced nutrition that I personally use and recommend to all of my clients. Use my health coaching code “pacerkristen” for $50 or 25% off (the greater of the two). When you can find the foods you like, and they are organized in a neat and tidy fashion, it’s easier to be inspired for eating healthy. I hope you will share your kitchen “redo” and tag me when you do @pacerkristen #pacerkristen. I’m anxious to hear about your successes!